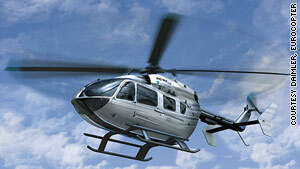 To get VIPs to buy its EC145, Eurocopter teamed with Mercedes-Benz to add luxury touches inside. (Wired) -- For the days when traffic is heavy and the CL600 in the garage isn't quite going to cut it, Mercedes-Benz has partnered with Eurocopter to deliver that luxury car touch to your helicopter. Starting with the popular twin engine EC145 helicopter, Mercedes-Benz designers have added their own unique take on a helicopter interior for discriminating customers looking for leather seats, fine wood trim, ambient lighting and of course a flat screen TV. The project to develop the luxury helicopter was led by the Mercedes-Benz Advanced Design Studio in Como, Italy. Like many car companies, Mercedes-Benz has a design studio that works with a range of customers. In the past BMW has worked with Airbus on interior designs and Porsche has played a role in yacht design. But the partnership between Mercedes-Benz and Eurocopter may have a bit more of a logical connection. Eurocopter is pushing the EC145 for use around the world as VIP transport. The helicopters are popular as corporate transport and there have even been versions built with missile protection systems for transporting government officials. With many of these kinds of customers likely getting to their helicopter in the back of a Mercedes-Benz, it only makes sense for the car company to transfer the same experience into the helicopter. A press release from the car maker says the interior "bears all the hallmarks and passion of Mercedes-Benz style." There aren't any specific kinds of materials listed, though we assume "deluxe materials" means pretty much anything the customer wants as long as it can pass the air safety rules. But the "EC145 Mercedes-Benz Style" as it is being called, isn't all luxury. There's mini-van like practicality as well. The helicopter can seat up to eight, but with all of the seats mounted on rails, your rotary winged ride can be converted to accommodate a pile of luggage and fewer seats if your trip necessitates some bulky items and only a few close friends. And for those long trips, there's a 15 inch TV with DVD player, plus a cool box to keep the snacks fresh. No word on whether or not the guys flying the Army's version of the EC145 will see any of the "Mercedes-Benz Style" cross over into their slightly more utilitarian, UH-72 Lakota.